The ideology of hate has proven that it will target anything that comes in its way – even if it is a 14-year-old girl. In a harrowing incident that shocked the nation on Tuesday, three armed men intercepted a van carrying schoolgirls, identified their target and then shot her, point blank. 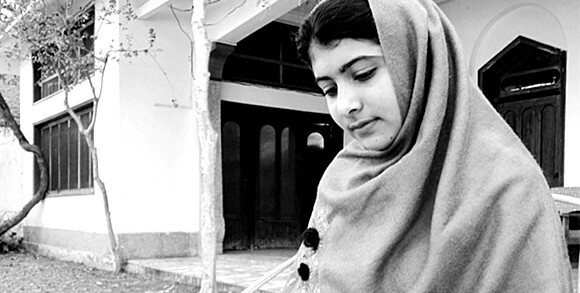 Their target: iconic child activist and National Peace Award winner Malala Yousafzai. An outspoken critic of the Taliban and vociferous proponent of female education, Yousafzai won international recognition for highlighting Taliban atrocities in Swat with a blog for the BBC three years ago when militants, led by radical cleric Maulana Fazlullah, burned girls’ schools in the valley. Yousafzai was 11 when she started writing the blog in late 2008. On Tuesday, she was on her way back home after sitting for a midterm examination paper, when the gunmen attacked and critically injured her. She is currently in critical condition. Three of her friends were also injured. Tehreek-e-Taliban Pakistan (TTP) claimed responsibility for the attack, saying Yousafzai criticised the group, and called her a ‘Western-minded girl.’ In a chilling warning, TTP’s spokesman said that there would be follow up attacks if she survived. As condemnations and expressions of shock and outrage poured in from all quarters, doctors in Peshawar battled to keep her alive. According to details, three armed men intercepted the van carrying Yousafzai and other female students near Sharifabad area of district Swat. The armed men asked about Yousafzai, said Usman Ali, the driver of the van while talking to reporters. “The man who stopped the vehicle signaled to his other armed accomplices that Yousafzai was inside. Another armed man went to the back of the vehicle, and started firing inside,” Ali said. Yousafzai and her three friends –– Shahnaz, Kulsoom and Shabnam –– sustained injuries. She was initially rushed to Saidu Hospital, where Medicinal Superintendent Lal Noor said that, despite head injuries, Yousafzai was in stable condition. He said a bullet is still inside her body but added that Yousafzai could talk, and answered his questions. She was shifted via helicopter to Combine Military Hospital (CMH) Peshawar where a team of senior doctors completed her medical examination, and stated her condition as critical. “We have thoroughly examined her, she is in critical condition. The bullet travelled from her head and then lodged in the back shoulder, near the neck,” a doctor in CMH told AFP, requesting anonymity. “The next three to four days are important for her life. She is in the intensive care unit and semi-conscious, although not on the ventilator,” he said. Taliban spokesperson Ehsanullah Ehsan told AFP that his group carried out the attack after repeatedly warning Malala to stop speaking out against them. “She is a Western-minded girl. She always speaks against us. We will target anyone who speaks against the Taliban,” he said by telephone from an undisclosed location. “We warned her several times to stop speaking against the Taliban and to stop supporting Western NGOs, and to come to the path of Islam,” he said. “This is a clear a message for the rest of the youth as well. Whoever is found following Yousafzai, will meet the same fate,” Ehsan said, adding the TTP will conduct follow-up attempts if Yousafzai survived this time. The 14-year-old received the first-ever national peace award from the government last year, and was nominated for the International Children’s Peace Prize by advocacy group KidsRights Foundation in 2011. Condemnations flew in from all quarters, including the president, prime minister, the opposition chief, even the US State Department. President Zardari strongly condemned the attack, but said it would not shake Pakistan’s resolve to fight militants or the government’s determination to support women’s education. The president also directed that Yousafzai be sent abroad for medical care. Khyber-Pakhtunkhwa Information Minister Iftikhar Hussain, who lost his only son to militants, termed Taliban’s act ‘cowardice’ and called for a sweeping military offensive against all militants in northwest Pakistan. “A team of neurosurgeons is examining her condition and they said there are 70% chances that she will survive,” Hussain said at a late night press conference on Tuesday. The minister asked the nation to pray for her life. Yousafzai’s father, former Swat Peace Jirga spokesperson Ziauddin Yousafzai, made an appeal to the nation to pray for her recovery. “She is a daughter of the nation, and represents the country’s female folk. I request the nation to pray for her recovery,” Ziauddin said. District Police Officer (DPO) Swat Rasool Shah told The Express Tribune that an FIR of the incident has been registered, and a number of suspected persons have been arrested in search operation in different areas of Mingora.